There is plenty of ‘buzz’ about the soon to be released PADI eLearning program. We are certainly excited about the potential of this program at Easy Divers Cyprus. We anticipate that there will be plenty of questions about this program from students, customers, and visitors to our Easy Divers Online website. We have assembled some of the frequently asked questions here and have provided the most accurate answers we could find. PADI eLearning Program Problems, Please remember that this program is still a work in progress and there may still be changes in the way things work. That being said, review the Frequently Asked Questions for many of the answers about the new PADI eLearning program for the open water diver program. PADI eLearning is Available Right Now! Your Scuba Study Made Easier! eLearning is a general term that describes the entire battery of training and education using the power of the internet as the primary medium for knowledge acquisition. eLearning is now an integral part of obtaining a college degree in almost any subject, including accounting, engineering, mathematics, and many other subjects. The PADI eLearning program you are now exploring or considering is simply the application of these same internet techniques to the subject of scuba diving certification. While no agency or training school can teach you to dive on the internet, the PADI eLearning program provides you with the most interactive, media-rich home study option available for the development of the academic knowledge necessary to continue to the water skills development portion of your diving class. Using the PADI eLearning program, you advance to your Easy Divers confined water and open water class segments with full confidence that YOU number among the most academically prepared students in any scuba diving class, anywhere. How is PADI eLearning different from traditional home based study options for scuba training? PADI student divers have always had access to the finest academic study materials in the industry. The PADI Go Dive Crew pack, used for years by PADI students, is considered the most progressive and scientifically based study materials for learning the academic knowledge important for scuba diving training. When used along with the PADI Go Dive companion DVD, the PADI materials represent the most complete materials kit offered by any scuba training agency. PADI eLearning is a natural extension of the core academic materials necessary for scuba diving education, upgraded to take full advantage of the interactive, multi-media capabilities of the internet. The manner of presentation and the full battery of media available with the PADI eLearning program radically enhances the natural learning process that has been the cornerstone of the PADI learn-to-dive program for over 25 years. With PADI eLearning, we feel that the home-study portion of your training experience will be more comprehensive, more complete, with higher levels of material retention, than ever before. PADI eLearning is simply the natural evolution of the patented PADI training process. Why has PADI decided to change to eLearning from the older, traditional methods? As a training organization, PADI has developed a great reputation for change and continuous improvement. 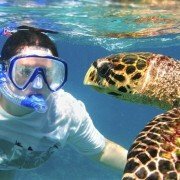 As the leader in world-wide dive instruction, they are constantly making changes to the materials, support services, skills standards, and teaching techniques for scuba education; all designed to improve the learning process and make you a better scuba diver. Changes are important to incorporate the latest information and understanding about diving. Their past changes to allow more flexible classroom presentations made scuba diving education available to many people who could not fit into a 6 or 8 week class due to their work schedules. Their introduction of the PADI Go Dive Student crew pack made home-study a true and viable option for the academic learning. All of the changes, both large and small, in teaching techniques for both academic and water-skills teaching methods are text-book examples of continuous improvement. This latest change to add eLearning to the battery of available methods for academic instruction represent nothing more than a further advancement in the continuous improvement model they have always used. A newer generation of prospective scuba divers are already comfortable using the internet for many things in their current lives; the addition of scuba education to this medium is perfectly natural. Most important….PADI believes strongly that eLearning will be an IMPROVEMENT in the delivery of academic learning for scuba training. 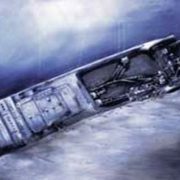 The result will again be better, safer divers through improved training techniques. That, more than any other reason, is driving PADI eLearning. What compromises did PADI make in the class content in order to implement eLearning? Absolutely none! Each professional PADI scuba instructor has always been responsible for ensuring that every open water scuba class is conducted in full compliance with all published teaching and performance standards. There have been no changes in the teaching standards to accommodate eLearning. The PADI teaching method is a performance-based course of instruction. That simply means there is no set number of hours of classroom or predetermined number of hours of time in the water. Students of a PADI diving class must demonstrate mastery of the academic concepts, water skills, and water safety requirements outlined in the standards for the class, regardless of how little or how much time that takes. This is what performance-based training is. The PADI eLearning program simply does not require any changes to current performance standards. There is always been flexibility in how the academic material is presented; eLearning is simply another choice in the battery of available methods. We are fairly confident that eLearning will be a MORE complete and comprehensive learning method than those currently available to us. We always want you to remember one very important thing……..NO changes will ever be made to a Easy Divers/PADI class that shortcuts any crucial learning element, or reduces the level of skill development you get, simply for the sake of expediency or profit. The Easy Divers classes will always be comprised of those skills and learning segments necessary to make you a fun and safe scuba diver for life! How long does it take to complete the PADI eLearning home study program? Simply put, it takes as long as you make it! The PADI eLearning system is a totally self-paced training solution for the beginning diver. This is the most important part of the new program. You get to spend as much time as you desire on each section. You are free to listen, read, review, and repeat any section or subsection of the material as you need for full comprehension. Throughout the PADI eLearning program, there are video and audio components to explain almost every important academic element. You spend the time that is necessary to fully comprehend each element. You are then tested with section and chapter quizzes to determine what you know and what you need to learn more about. At each testing phase of the program, remedial training steps are built in to make sure you complete the necessary learning. When you are completely finished with all of the material, a final examination is administered and immediately scored to allow you to remediate your training and move on to the water skills portion of your training. Once you register for eLearning, you have one year to complete your academic study. Of course, most people will finish in a very small fraction of this time. After all, the real fun begins when you complete the eLearning program! What if I get stuck and need help from a real instructor? While you may sign up for a PADI eLearning program, you will be a student of Easy Divers in Cyprus. Immediately after you sign up for the eLearning program, we will be notified that you have done so and will begin our communication directly with you. Our staff of full-time instructors will always be available to assist you with any problems or questions. We will keep a constant eye on your eLearning progress and will use every communication technique available to us to assist you in your learning process. Just as we have always done, we welcome you in for one-on-one instructions on using the Recreational Dive Planner, on understand buoyancy, or any other subject that is delaying your progress. We will offer tutoring sessions prior to your water skills work, and of course, you will benefit from our standard academic reviews on each morning of your confined water training. With Easy Divers, you are never training alone. We are always here to help you. Isn’t it easy to cheat on an internet based training class? Well of course it is. Cheating is always the easy way out. However, you come to us to learn to scuba dive. We make the assumption that you are serious and really want the knowledge of how to dive safely. The home study portion of your dive training forms the foundation upon which you build all of your diving skills. The information you learn during your home study is essential to you continuing dive education. The PADI eLearning program is based on your commitment to learn the material to provide a solid base for your water skills training. Your commitment to learning to dive will require you to complete the course properly and require you to dedicate the time necessary to complete all aspects of your learning experience, including the eLearning program. Along with the exams and quizzes integrated into the eLearning program, we administer a short version of the written examination prior to beginning your water skills confined water weekend. We know that you are eager to become a scuba diver for life and are willing to dedicate the time necessary to do it properly. How do I sign up for the PADI eLearning program? That is the simple part. You can click any of the SIGN UP NOW! links on our Easy Divers Cyprus Online website, or you can visit our retail showroom and we will assist you with the sign up process. When you sign up for the PADI eLearning program, you will create a My PADI account on the PADI website and provide the information necessary to establish your credentials as a PADI eLearning customer. At this stage of the process, you will provide your credit card information and PADI will reserve YOUR seat in the virtual eLearning classroom. You can then immediately begin your study process or you can wait until later to begin. Easy Divers Cyprus and PADI have made this extremely simply for you. Already Heard Enough? Ready to Sign Up Now? Click the Link to the Right to Begin PADI eLearning ! Do I have to do my eLearning study from the same computer I use to sign-up initially? Absolutely not! You can access your PADI eLearning program from any computer that has internet access. PADI eLearning Program Problems doesn’t mean you will lose your page, you can continue where you left off? This means you can study at home, at work, while on vacation, or anytime you have a few minutes available and have access to the internet. The structure of the PADI eLearning program does not install any cookies on any computer, does not require the recognition of any particular IP address to function properly, and does not demand any particular amount of time for any study session. You work where you want, when you want, for as long as you choose. In fact, you are welcome to come into Easy Divers and make use of one of our computers in our dive training learning lab. Easy Divers and PADI eLearning make it easy for you. How do I know if my personal computer has all of the “stuff” necessary to run the eLearning program correctly? PADI has designed the initial sign-up process to accomplish many goals, among them being testing your computer for compatibility with the eLearning program. Almost all modern computers will be well-equipped to use this program. During the sign-up process, PADI gives you a sample demonstration of how the eLearning program works. This is your opportunity to determine if you have everything present to make the program work correctly. This computer-test phase of the sign-up process is just another example of the degree of professionalism built into the eLearning platform. Can more than one person use the eLearning program to do the home study? No. Each student must have their own PADI eLearning account and each individual must pay the eLearning fee to PADI. The eLearning program measures progress, maintains records, and validates test results for each student independently. More than one family member can study from the same computer, but each family member must have an individual account and an individual “seat” in the virtual PADI eLearning classroom. Unfortunately, due to internet privacy laws, students must be at least 13 years of age to enroll in the PADI eLearning program. Students between the ages of 10 and 12 must use the standard Go Dive printed materials for academic training. Why can’t my 12 year old use the eLearning program? I’m Confused. Don’t I need a dive shop to learn to scuba dive? Absolutely yes you do! You certainly can’t learn to scuba dive over the internet. 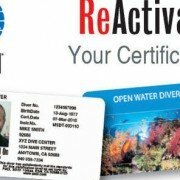 You will need to affiliate with a dive center to complete your diving certification. PADI has the largest network of affiliated dive centers and resorts in the world. A dive center must demonstrate excellence in customer service, facilities, and instructional programs to qualify for the PADI seal of approval and membership in the PADI Dive Center and Resort program. The PADI eLearning program integrates your selected PADI Dive Center into every element of your eLearning experience. The importance of the dive center in your education process is so significant, you are required to choose and affiliate with a center PRIOR to being allowed to register for the PADI eLearning program. Your chosen dive center will likely be a center close to where you live and will assist you throughout your entire eLearning process. Once you complete the academic study, you will go to the dive center and begin your water skills training. Important Note: If you sign-up for eLearning through a link from our website, or during a visit to our store, Easy Divers will automatically be your chosen dive center. The PADI eLearning process will simply skip the Select a Dive Center portion of the enrollment process and will automatically affiliate you with Easy Divers in Cyprus. .
What is the importance of being linked to a PADI dive store from the beginning of the eLearning training? This is a key – in fact, possibly the most important – aspect of the PADI eLearning program. As we have stated before, you cannot learn to scuba dive over the internet. While you could complete your home study without help, you will eventually need the services of a PADI Dive Center to complete your scuba training. The professional PADI instructors in a PADI Dive Center are your resource for questions about your academic learning, they are your contact for scheduling the eventual water skills sessions necessary to complete your dive training, and are your primary resource for advice on the purchase of the personal equipment necessary to continue your learning adventure. From the moment you sign up for your eLearning class, you will be in communications with your chosen PADI Dive Center. A number of communications channels are embedded in the eLearning program and all of these begin with your selected PADI Dive Center. Without the PADI Dive Center and the services of your professional PADI dive instructor, your eLearning program would be an empty information shell, not unlike any other website you might visit. Am I forced to continue to my water skills session with the Dive Center I selected when I signed up? Of course not! As an open water diver candidate, you are a student. You are also a customer. As with all customers in any commerce, you are free to use any Dive Center you choose to complete your water skills work. In fact, PADI anticipated that many eLearning customers might select one dive center for the eLearning process and decide later to use another for the water skills work. Completion of the PADI eLearning program will provide you with an Academic eLearning Referral, a completely portable document that demonstrates and certifies your readiness for continued progress in the open water program. This document will be accepted by any PADI Dive Center anywhere in the world. When you purchase the eLearning program, you are only paying for access to the home-study academic study process. The cost of water skills training is a matter between you and your PADI Dive Center. While you may designate one Dive Center as your “original” affiliated store, you are free to choose ANY PADI professional dive instructor or store to complete your training. As operators of an international e-commerce website, Easy Divers fully expects to be the “affiliated” Dive Center for many people that live far away from our training center and will never complete their dive training with us. They may elect to actually use a store in their local area or they may elect to complete their dive training in a more exotic location. Regardless, all students who affiliate with us during sign-up will get the attention and assistance from our professional instructors throughout the eLearning home study process, using a variety of communications techniques. You can then select any dive center in the world for your water skills training. If desired, we will assist you in selecting a PADI Resort in the location of your choice. What does it cost to enroll in PADI eLearning? 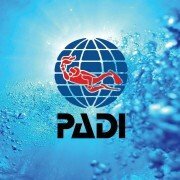 The fee for the PADI eLearning program is €142 Euros. This fee provides you with access to the PADI eLearning program for a full year. It also provides you with access to an on-line version of the PADI Go Dive training manual for the entire year. Think of this as the internet version of the PADI Go Dive Student crew pack and the companion Go Dive DVD, with lots of extras of enhancements and extra features too. It is important for you to understand this price structure. The cost of the water-skills portion will be in addition to this fee and will vary with the Dive Center you choose. Easy Divers Cyprus open water course is €440 inc the course book. Since PADI provides the online portion of this book, you need not purchase the book. 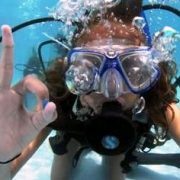 So we give elearner a discount the additional €365 includes your Pool and Open Water session and your certification for Padi. In addition, you will need to purchase a PADI Log Book (but we will give you this for FREE). Easy Divers Cyprus has these materials available in a PADI eLearning Enrichment Pack also. Isn’t this a lot more expensive than the PADI Go Dive crew pack? Well, it is slightly more expensive than doing it the “old way”…….but not a lot more expensive. If you come to Easy Divers Cyprus and purchase the traditional PADI Go Dive Crew Pack and the PADI Go Dive Companion DVD, you would spend about €85. So the cost difference is minimal. But what you get for that difference is pretty astounding. It is important to remember that the PADI eLearning program is really much more than a computerised crew pack. It is a combination of multiple teaching mediums, integrated into a program that provides a structured self-study environment, keeps track of your progress, measures the need for remedial study, administers section, chapter, and final examinations, and stores your student records for years to come. It allows you to do this at YOUR convenience instead of the schedule established by someone else. In addition, we think it results in a much more complete and comprehensive academic training experience than would likely be possible with the printed materials alone. It allows you to design your academic study program to meet your schedule, when you want, where ever you are, without the need to lug your crew pack around. All you need is a computer, an internet connection, and some time to spend in the virtual classroom. While we have no proof (because the program is brand new) that eLearning students will have a deeper understanding of the academic principals of diving using this method of study, similar eLearning programs at major universities clearly demonstrate deeper, more long lasting material retention using internet based learning. So, it is not fair to strictly compare the price of the old home study methods and the eLearning program. In short, eLearning is MUCH more than a computerised Go Dive crew pack. Does eLearning completely eliminate the classroom portion of scuba classes? Well, the most accurate answer to that question is both yes and no. Regardless of how you learn your academic material, there will always be a need for some face-to-face academic contact with a scuba instructor. In the beginning, Easy Divers will have confined water classes that are made up of both eLearners and traditional home study students. As is currently the practice, each of the two days for our confined-water classes will begin with an academic review and tutor session in the classroom. Each of these days includes approximately 2-4 hours of this type of review. Traditional home study students must also submit to the final examination prior to completion of the course. Students that use the eLearning approach will have the option of attending these morning sessions, or waiting until mid-day to go directly to the pool. We anticipate that most eLearners will choose to attend the sessions. Of course, eLearners must also take the 20 question quick exam, proctored by our instructors, prior to receiving final certification. As time goes on and more of our students begin to select the eLearning option, we may revise the structure of our confined water classes. Until that time, eLearning students will simply integrate right into our traditional confined water classes. Discussion directly with Easy Divers Cyprus instructors will help you determine what is right for you individually. How is the testing done to determine if I have properly learned the eLearning material? The PADI eLearning program depends heavily on student examinations, response scoring, and remediation training to ensure that the eLearner is retaining the knowledge necessary to proceed to the water skills portion of the training. There are Quick Quiz-Self Assessments sprinkled throughout the eLearning program. These Self Assessments appear immediately after the associated material segments are presented. Each multiple-choice or true/false question requires you to pick an answer and submit the response for immediate feedback. If incorrect answers are given, the student is shown the proper answer and guided to the specific section of the program for a review of the learning content. At completion of entire sections (chapters), you progress to the Knowledge Reviews for that section. These examinations have a variety of question forms; multiple-choice, mix and match, true/false, one word fill-ins, and other question forms. You answer and submit these questions one at a time and are given immediate feedback. Dialog boxes appear indicating whether the answer is correct or incorrect. For incorrect answers, an explanation is given for the correct answer, including where you must go to get the information on the correct answer. You MUST review the previously covered material before moving forward. After completion of the entire material in the eLearning program, you take a Final Exam. If any questions are missed, you will have the opportunity to review the missed questions, along with the material in the appropriate section that covers the answer. You will retake the exam until you are able to demonstrate mastery of the academic skills. Upon completion of the successful Final Exam, your record will be stored and the eLearning Completion Referral document will print. 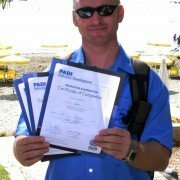 What proof do I have that I completed the PADI eLearning program? When you complete the entire eLearning program and register a passing score on the final examination, you will print out a PADI eLearning Open Water Referral document. This document can be presented to any PADI Dive Center or PADI professional dive instructor and serves as proof that you have met all of the training standards for academic study. This will be all you will need to move directly to the water skills portion of your dive training. Prior to being awarded your PADI Open Water Diver certification card, you will be required to take one additional written Quick Exam, proctored by your PADI dive instructor. Of course, the PADI offices will always be able to provide proof of your eLearning completion should you lose or misplace this referral document. What if I start eLearning and realize I am not cut out for study on a computer? That is simple. We will not make you do anything that you feel is uncomfortable. You simply notify us and we get you set-up to do the home study the “old way”. You must remember that you paid your €142 eLearning fee directly to PADI and you can’t get that fee back. You will also be required to purchase a text book to complete your study the traditional way. However, you will still have your “seat” in the virtual eLearning classroom, so you can use a combination of eLearning and traditional reading. You always have choices. The important thing is…..you start and stop when you want, on your own schedule. We want every new student to give eLearning a try. With the assistance of our staff instructors, our classroom reviews on each morning of the confined water sessions, and the availability of one-on-one tutoring during any weekday, we are sure that completing your home-study will be simple, no matter which medium you choose for your personal study. Is eLearning a suitable study method if I want to continue my training in a more exotic, foreign location? It is absolutely the BEST method for this type of student diver. The popularity of learning to dive during vacation outings is growing by leaps and bounds. PADI eLearning is going to make this type of diver education even easier. In the past, if you wanted to complete your academic study at home and do your water skills work at a dive destination, you were required to purchase a PADI Go Dive Crew pack. During your home study the traditional way, you lacked the support of a PADI professional instructor during the study process. With Easy Divers Cyprus Online and the PADI eLearning program, the difficult becomes simple. Our internet website serves customers all over the country and all over the world, with the best scuba gear available. Now, we will be able to do the same with dive training. During your home-study using the PADI eLearning system, the Easy Divers Cyprus instructors will be in constant communication with you through a variety of communications techniques built right into the PADI eLearning program. You will have access to our instructors via our toll-free telephone number. We will help you complete your academic study and will assist you in preparing for your water skills work in the destination of your choice. Finally, with PADI eLearning, you can extend your classroom to any resort in the world.